January is finally over and what better time to focus on a bit of love. 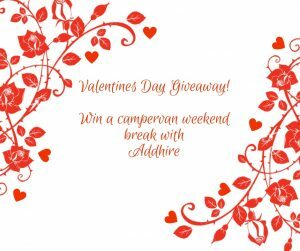 This Valentines Day we are offering one lucky winner the chance to win a weekend in one of our fully equipped campervans. Our VW Jobl Campervans are like a home from home and make the perfect winter adventure. Where will you go in yours? Like our Valentines Giveaway competition post, tag some friends in the post (sharing is caring!) and share the post. The more friends you tag, the greater your chances of winning. The lucky winner will be generated at random, we will announce the winner on 15th February. The weekend campervan hire must be taken before 31st March 2019. Please contact Addhire on 0151 350 6875 to discuss availability.